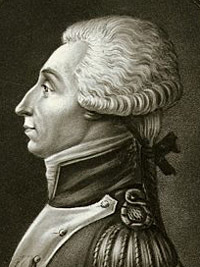 French aristocrat Marie-Joseph-Paul-Yves-Roch-Gilbert du Motier, marquis de Lafayette, fought with American colonists against the British and, as a leader of the liberal aristocrats and outspoken advocate of religious toleration, was a powerful influence in the first few years of the French Revolution. There is no question that Lafayette was a freemason, for the Grand Lodge of Pennsylvania received him with distinguished honours during his last visit to the USA, and the Grand Lodge of Tennessee made him an honorary member when Andrew Jackson, seventh USA president (1829-1836), introduced him to that Grand Lodge in 1825. Where he was made a freemason though, remains an unanswered question. It was long a tradition that he was initiated at a meeting of American Union Lodge held December 27, 1797 over the old Freemans Tavern, on the north side of the green, Morristown, New Jersey. Gould, in his Library of Freemasonry, repeats this story but backdates the event to 1777, while another tradition places his initiation in a military lodge held at Valley Forge the winter of 1777-78. All of these stories are predated by the earliest extant document bearing Lafayettes name. In 1941 the Library of the Supreme Council acquired a printed programme for the inauguration of Lodge St. Jean de la Candeur in Paris in December 1775. Lafayettes name is included in a list of 100 "Les Chers Freres Visiteurs" attached to the programme, establishing conclusively that he was a freemason before he arrived in America. Source: Short Talk Bulletin, vol. vi, no.7 (July 1928); vol. xi, no. 7 (July 1933); vol xii, no. 4 (April 1934). The New Age magazine, July 1941. 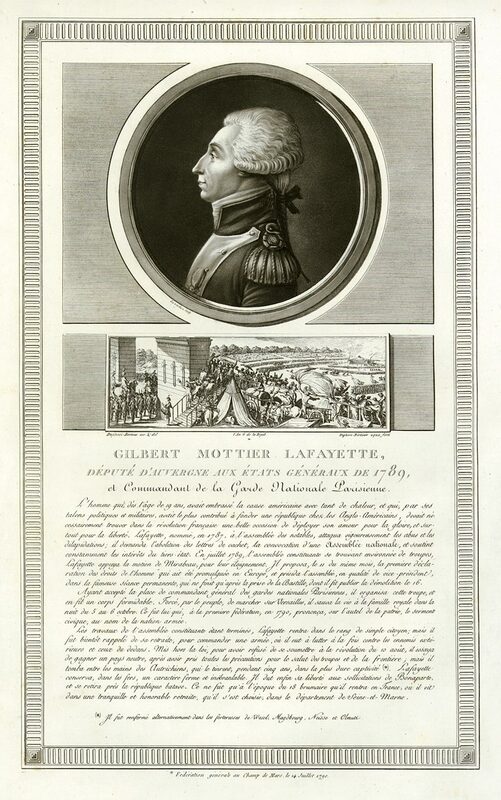 Illustration: "Gilbert Mottier Lafayette, Depute d'Auvergne aux Etats Generaux de 1789 ... " engraved in aquatint by Duplesi-Bertaux, published in Historical Pictures ... of The French Revolution, Paris, 1803 (plate dated 1790.) Plate mark and good margins. Size 22.5 x 36.5 cms to plate mark. Ref D8712.